Chesterfield-based renewable energy company Custom Solar have thrown its weight behind the Festival of Cricket for the next three seasons. 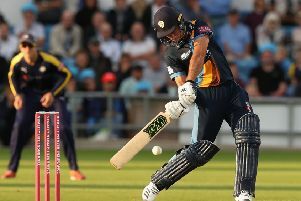 The annual six-day festival, which starts this year on Sunday, July 3, will see Derbyshire Falcons face Northants Steelbacks and Yorkshire Vikings in two NatWest T20 Blast fixtures. There will also be the Specsavers County Championship fixture versus Northamptonshire which begins on Monday, July 4. Custom Solar Director, Matthew Brailsford, said: “To sponsor the Chesterfield Festival of Cricket is an exciting prospect. “As a local Chesterfield business we remain active across the region and where possible support events that raise the profile of the town and county. To do this in partnership with one of our flagship clients is ideal for us. Derbyshire County Cricket Club Chief Executive, Simon Storey, added: “We’re delighted to extend our partnership and to have Custom Solar as our principal festival sponsors for the next three years. NatWest T20 Blast - Derbyshire Falcons vs Northants Steelbacks (Sunday 3 July; 2.30pm), Derbyshire Falcons vs Yorkshire Vikings (Sunday 10 July; 2.30pm). Specsavers County Championship - Derbyshire vs Northamptonshire (Monday 6 July to Thursday 9 July; 11am).